You can use almost any kind of summer fruit for these shortcakes, whatever you can find that is fresh! Mix the fruit and first 5 tablespoons sugar together in bowl and set aside for at least 30 minutes. Mix flour, baking powder, salt and 3 tablespoons sugar in work bowl of food processor. Scatter the butter pieces over mixture. Cut butter into dry ingredients with 1 second pulses. Continue cutting in butter until flour is pale yellow and resembles coarse cornmeal, with the butter no larger than small peas. Turn mixture into a medium bowl. Mix beaten egg with half-and-half; pour into bowl with flour mixture. Combine with rubber spatula until large clumps form. Turn mixture onto a floured work surface and gently knead until it comes together. Pat dough into a 9 by 6 inch rectangle about 3/4 inch thick. Flour a standard biscuit cutter; cut into 6 rounds. Place rounds on small baking sheet. Brush with the egg white and sprinkle the remaining 2 tablespoons of sugar. Bake until biscuits are golden brown, 12-14 minutes. Place the whole baking sheet on a wire rack and cool until warm, about 10 minutes. When the biscuits have cooled slightly, cut gently around the circumference of the biscuit. Place each bottom on a single serving dish. Spoon fruit mixture, with the collected syrup, on top of the biscuit half. 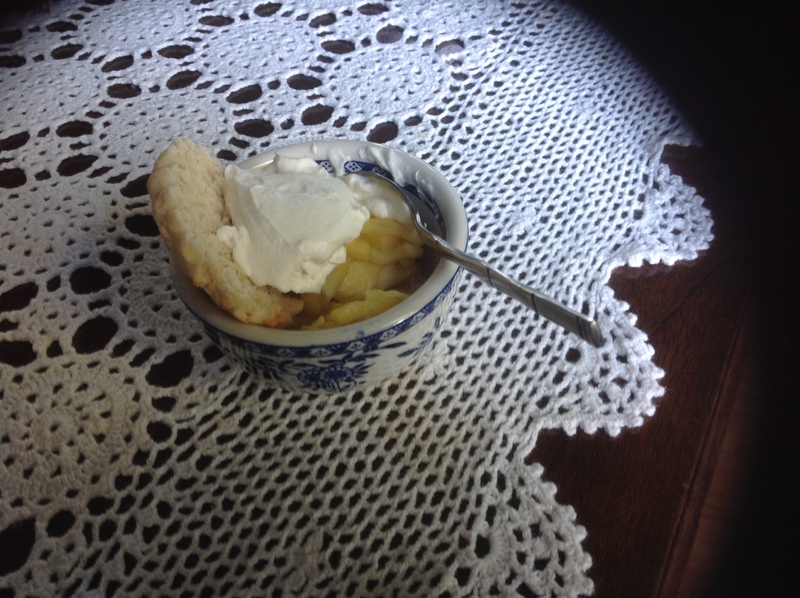 Add a “dollop” of whipped cream over the fruit and top with the biscuit top. In a medium bowl put 1 cup of heavy whipping cream with a splash of vanilla extract. Using a hand-held mixer, start whipping the cream on low. Start to slowly add powdered sugar until about 1/2 cup of powdered sugar has been added. Continue whipping until the cream gets to stiff peaks, it will hold a stiff “peak” when the beater is removed from the cream.